We offer a complete menu of fixture types and lighting to create a captivating atmosphere in your dining ...	room. Whether you're enjoying a meal with family and friends or sitting down to catch up on a few bills, you'll find many satisfying options for elegant dining room lighting. Glowing centerpiece lighting creates the perfect mood for dining and entertaining. Add a dash of warmth and radiance with your lighting. Decorative accent fixtures enhance the ambiance of a dining area. Superb lighting options for a dining room console or sideboard. For optimal lighting, fixtures should hang 30-36" above the dining table. 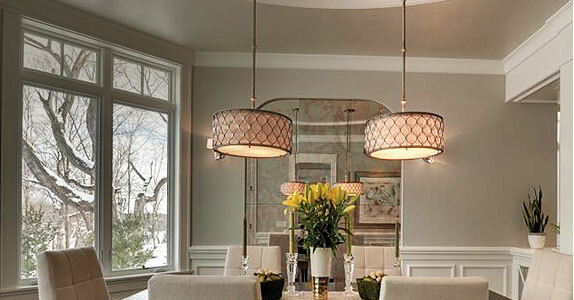 Choose a chandelier that's 1/2 to 3/4 the width of your dining table. Put your chandelier on a dimmer to instantly adjust the mood of the room.